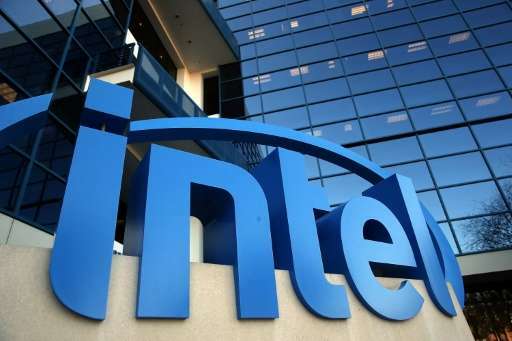 Intel and Micron Technology say chips with 3D XPoint technology are a "major breakthrough"
Intel and Micron Technology on Tuesday unveiled what they touted as a new kind of memory chip that could "revolutionize" computing devices, services and applications. Intel and Micron reasoned that the explosion of connected devices from smartphones and fitness bands to power meters, appliances, cars and more is generating massive amounts of new data that must be stored and analyzed quickly. Examples given of benefits from the technology included shop owners more swiftly identifying fraud patterns in financial transactions; health care researchers analyzing data in real time, and tracking diseases or parsing genetic data. can you please write a few more technical details? @verkle: Agreed - a technical/science website should have at least some technical details. Partly it is that few details are available, but the writer didn't even dig for those. The micron web site(http://www.micron...chnology ) has a bit more, and their long video has a few technical details from 10 to 14 minutes in, but it is still mostly just marketing. The Q&Q says products on the market in 2016, cost between NAND flash and DRAM, and 1000x the re-write performance of NAND flash, and 'faster' read speed. But no lithography spec or feature size, no numbers on the read speed comparison, and no die size details on either web site. Agreed, this article isn't science journalism, it's a press release aimed at nontechnical readers. This isn't what we come to Phys.org to read. I've absorbed fuller articles elsewhere on the net. Interesting fact: it's a transistorless technology. In other words, it sidesteps Moore's Law entirely - instead of doubling transistors every two years and halving the cost, it does away with transistors and does something completely different to speed up computers. The *idea* behind Moore's Law (faster and cheaper over time) is intact and robust, but perhaps it needs to be restated in terms other than transistors. This nonvolatile memory tech is plenty fast enough to be used in place of dynamic RAM - in fact the distinction between computational memory and storage could vanish altogether. If it makes it to market, computer architectures are going to go through some big changes. @Urgelt - yes, this looks like interesting technology. If it lives up to its promises it will have flash density and non-volatility with near-DRAM speed, endurance, and write granularity, and with scaling should become less expensive to make than flash. Yes, RS, details are in short supply. But not as short as Phys.org's presser would lead us to think. We know it's a 20 nm process, so there's room for improvement below that. We can see from photographs that the prototype chip appears to be a true 3-D design, something we haven't yet seen make it to market. We know it's transistorless. We know the memory density is higher than NAND/SSD densities and enjoys far superior durability. We know they're talking about read-write rates of 20 GB/sec, roughly - not as good as top-end DRAM (up to about 50 GB/sec), but better than low-end DRAM (9 GB/sec) and an order of magnitude better than NAND/SSD. We know that to take advantage of a storage device of this speed, a new architecture will be required. And we know that if a computer architecture is properly designed with this storage medium in mind, it's going to be blazingly fast. And non-volatile! There are an awful lot of pluses. It's a big jump forward. This might be OK for SSD/Flash use. Definitely not good for DRAM. winthrom, that's just the first iteration. They'll go to smaller nm processes, refine designs... most important, they'll optimize bus and CPU architectures to work with 3D XPoint storage. Perhaps they'll keep DRAM in early gen implementations and use 3D XPoint as just faster, more tightly-integrated drive storage. A bit later on, CPUs could access 3D Xpoint directly, along with DRAM, but I suspect OS, CPU and bus designs will have to be modified to make that work. If the technology keeps getting better, it might one day replace DRAM, but it doesn't have to replace DRAM to be useful in speeding processing, particularly data-intense processing (as with internet server farms). It won't do much for math-intensive computation. But there's an awful lot of data-intensive computing to do, and it'll help enormously with that - if they can bring it to market. Hopefully they can. In other words, a number of product cycles lie beyond 1st-gen performance characteristics. @Urgelt - I must have missed the 20 nm process - thanks. @winthrom - Intel has not said that this is phase-change memory, and Micron lists it in a separate section from their phase-change products, and intel insists that the new product involved totally new materials. None the less the slides of this new memory do look like phase-change memory, and PCM is a bulk-change resistive memory, so it looks and sounds like PCM. Have you confirmed that it is PCM? "Correlated Electron Random Access Memory (CeRAM) is a particular transition metal oxide (TMO) based Resistance Random Access Memory (RRAM) that does not involve electroforming and exhibits reliable unipolar resistance switching properties. A physical model of NiO based CeRAM/RRAM is proposed in the present work. The two stable resistance states in NiO are attributed to intrinsic metallic and insulating states of the material, rather than the creation and rupture of filaments. ..."
A breakthrough in this might be the type of variant that gets past the PCM write limitations. Intel/Micron are mum on what they are actually doing. of fatigue out to 1012 cycles. ..."
The abstract (http://adsabs.har........3X) says that the "default to ON" state of CeRam, a major problem, is fixed.